Can Disney make a 'Star Wars' prequel fans will like? The rebels of "Rogue One: A Star Wars Story" will be taking on an important and possibly difficult mission this weekend. No, no, not stealing the plans to the evil Death Star, but expanding the "Star Wars" franchise for Disney (DIS). "Rogue One" is Disney's first "Star Wars" spinoff, meaning that it takes place in the "Star Wars" galaxy, but doesn't directly involve the saga of the Skywalker family. And it presents an important challenge for Disney. The media company paid $4 billion for Lucasfilm, which included the franchise, in 2012 and to recoup the "Star Wars" portion of that investment it needs to be able to make new content built on the brand but without relying on the characters that have been known and loved for nearly 40 years. "Rogue One" is its first attempt at doing that. 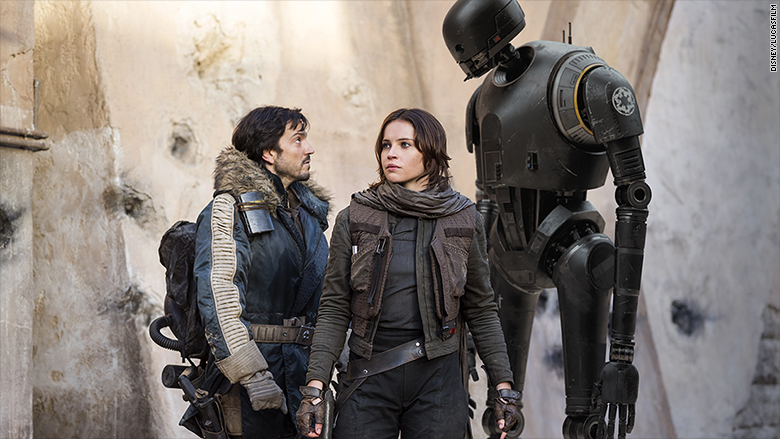 "Success for 'Rogue One' is a great litmus test for storytelling outside of the saga," said Dave Hollis, Disney's executive vice president of theatrical distribution. "This will give a great sense of how big these standalone stories can be and how they will be able to satisfy expanding the universe." The film, which stars Felicity Jones and opens in more than 4,100 theaters domestically starting Thursday night, is projected for a box office opening around $150 million in North America this weekend, according to industry analysts. That would make "Rogue One" the second biggest "Star Wars" opening ever and third largest opening of the year. Disney, however, is being a lot more cautious putting the number anywhere from $120 million to $150 million and stressing that predicting an opening weekend total at this level is "extremely difficult to predict." The studio has reason to be cautious: selling a movie with characters like Luke Skywalker, Han Solo and Princess Leia is easy. Selling one with Jyn Erso, Cassian Andor, and Orson Krennic? Not so much. But "Rogue One" may in its own way be as important of an opening for the House of Mouse as last year's "Star Wars: The Force Awakens." It's not just about the box office this time, though. With massive merchandising at stake, "Star Wars" films in the works through 2020 (including two standalone spinoffs), and new attractions that are the company's biggest theme park expansion ever, Disney has to prove to fans that the brand is bigger than the Skywalkers, and worth obsessing over as much as ever even without them. "Rogue One: A Star Wars Story" looks to bring in a big box office while expanding the franchise for Disney. Luckily for Disney, it's had practice building hugely successful cinematic universes with its interconnected multiple comic book film franchise, Marvel Studios. 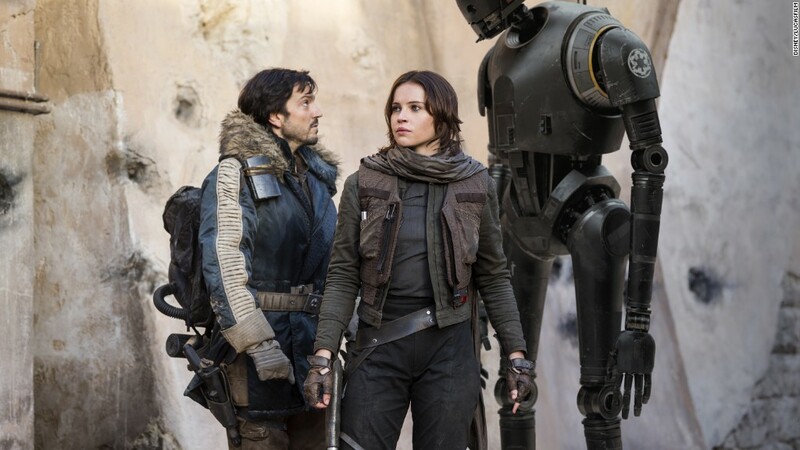 "'Rogue One's' success is very important for Disney and in the same way that 'Guardians of The Galaxy' and 'Doctor Strange' keep the home fires burning for the Marvel brand between 'Iron Man" and 'Avengers' movies, 'Rogue One,' as part of the 'anthology' arm of the 'Star Wars' brand, has a similar M.O.," said Paul Dergarabedian, senior media analyst at comScore (SCOR). Another box office battle that "Rogue One" may have to fight off this weekend is comparisons to last year's "The Force Awakens," the biggest opening in movie history and one of the biggest blockbusters of all time. "Force Awakens" opened last December to $248 million domestically and $529 million worldwide, but that film was a generational event that was anticipated by fans since 1983's "Return of the Jedi." So even if "Rogue One" brings in $100 million less in its opening than "Force Awakens" did for its debut, that's still a big win for Disney -- as long as fans are convinced of the long-term potential of Skywalker-free "Star Wars" content, of course. Prospects for success look good so far. Reviews have been solid -- the movie currently has an 85% score on review site Rotten Tomatoes -- and anticipation has been building for months, making "Rogue One" into ticket site Fandango's second biggest pre-seller of all time, behind only "Force Awakens."